This old folk song seems appropriate to Abraham. Rebecca and Eliezer at the Well , by Johann Ramboux, ca. 1819. We all profess that we are bound for heaven, immortality, and glory: but is it any evidence that we really design it if all our thoughts are consumed about the trifles of this world, which we must leave behind us, and have only occasional thoughts of things above? 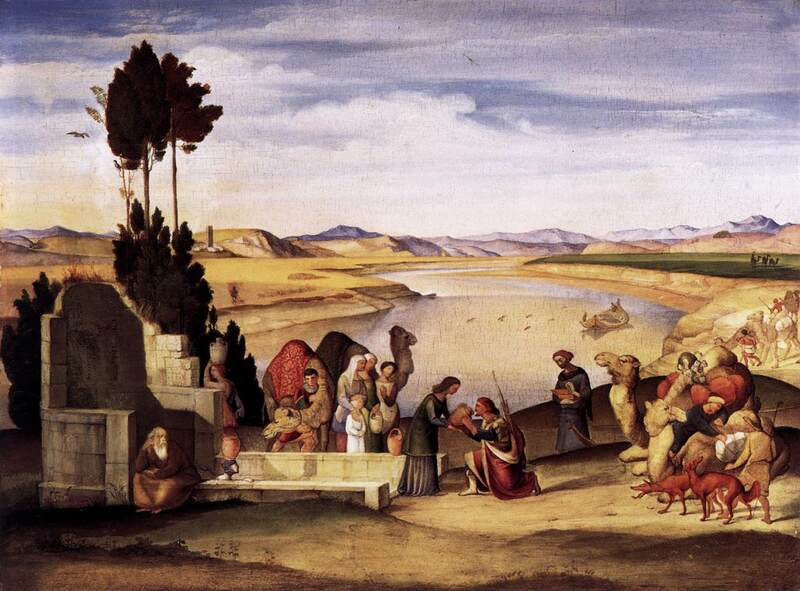 Then the servant took ten of his master's camels and departed, taking all sorts of choice gifts from his master; and he arose and went to Mesopotamia to the city of Nahor. And he made the camels kneel down outside the city by the well of water at the time of evening, the time when women go out to draw water. And he said, "O Lord, God of my master Abraham, please grant me success today and show steadfast love to my master Abraham. Behold, I am standing by the spring of water, and the daughters of the men of the city are coming out to draw water. Let the young woman to whom I shall say, 'Please let down your jar that I may drink,' and who shall say, 'Drink, and I will water your camels' — let her be the one whom you have appointed for your servant Isaac. By this I shall know that you have shown steadfast love to my master." Ten camels! 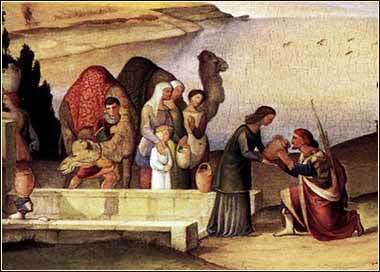 Having a camel in this day was like having a car today, so sending out ten of them was a pretty big deal, and Abraham has apparently loaded them with some nice merchandise — appropriate for gifts — as well. Nahor is a name, not a place. 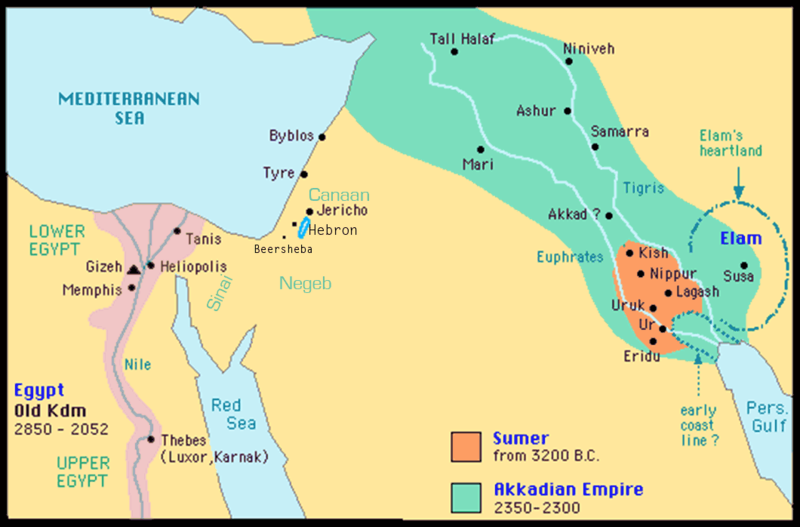 They are returning to the "city of Nahor", that is, to Ur of the Chaldees, the city where Nahor had lived (see map); Nahor was the name of both Abraham's grandfather and one of Abraham's brothers. So Abraham is sending his wife-scouting party to his ancestral home. The servant remains nameless. We learned in Genesis 15 that Abraham's majordomo (and his heir if he did not have a son) was named Eliezer. But much time has passed. The chief servant could be Eliezer, or his son, or some unrelated person. Certainly, Abraham's household would serve faithfully and their blood would mix with that of Abraham's descendants. Inbreeding eventually has unpleasant consequences, and the Hebrews would need a wider gene pool to thrive. But, as was the general practice, only the names of leaders and their descendants are recorded. The trusted servant, whoever he was, does not waste time. Having arrived at Ur, he rests by the well and, after a prayer to the Lord, determines to take the first single girl who will give him a drink. God does not speak to him, as He does to Abraham; so acting on his prayer might seem a bit risky. We get a tiny slice of Mesopotamian (probably Akkadian) culture. Fetching water was the task of young women, who performed the chore at sunset. (See painting.) It was no small feat. The water jars were heavy and, in many places, the wells could be deep structures with narrow spiral staircases. But the passage mentions a spring, so perhaps fetching water was a bit easier in Ur than in most places.